Everyone has seen the shift of music artists’ earnings focus from recordings to concerts and merchandising. As George Martin once said way back in the sixties, ‘the album is the menu, the concert is the meal.’ We have see huge defections away from the record companies by artists wanting to align to where they see the money. Now we read that Universal Classics and Jazz, the worldwide market leader in classical CD sales, has announced Universal Music Classical Artists Management and Productions. Universal dominate the classical music industry with 29% of the recording market with its nearest competitor Sony BMG, having only a 14% share. The new company will provide management services for and produce live events for prominent classical musicians. Artists who have signed up include Anna Netrebko, Elina Garanca, Karita Mattila, Joseph Calleja and Thomas Hampson. The new division will book tours and produce live events for its clients, not all of whom will be exclusive Universal recording artists. It is an obvious step by Universal to protect its classic business but is likely to prove too late for the pop and rock world who have already started to vote with their feet. All media producers now need to re-examine their role and relationship with their greatest assets –their creators. Books may be different but the questions still need to be asked. CopNews often comes in a series of blips and joining those together starts to give you the bigger picture or raise questions not answered in the often sanitized press releases. Last week we wrote on the then breaking news of Microsoft’s decision to walk away from Live book search and its impact. Today we read in the Guardian, that Belgian newspapers are asking for €49m in damages from Google for publishing and storing content without paying, or asking permission. Whether we are talking Google News or Google Books we are talking ‘digital land grab’. The process is simple - digitize and be dammed, or scan first and ask later. In the US the pending Orphan Act will make this sort of activity easier, but although we see the omnivore that is Google, there are others busy exploiting the availability of materials and the inability of many to achieve, digitize or in some cases know who owns what. Public domain book works are being scanned and digitised in droves by many. Some are also venturing into that murkier area between public domain and in print. We see two problems, one controlling the hovering up of today’s material and secondly the question of who owns what? Last year Google lost a lawsuit to a number of French-language Belgian newspapers and was forced to remove their content from Google News and their search engine that had been taken without permission. Copiepresse, an organization that represents the French and German language Belgian press, is now seeking damages based on articles stored via Google Search since 2001 and on Google News since it was launched in Belgium in 2006. Google has deep pockets and has taken a position which has contested the ruling, arguing that they drive traffic to publishers' websites and that Google News only shows headlines and snippets and thumbnail images. That’s ok then! Search and index the total work, take ownership of the digitalized content, but only show limited content today. The arrogance of such logic is at best questionable and at worst fascicle. Today, we now find ourselves at the mercy of Google and without that other omnivore predator. Publishers have in many cases argued it is healthy to give them content as they drive up sales, others that they are stealing it. Whatever your viewpoint the question that must be answered is what do they intend to do with it tomorrow? Will they always us it as they do today? Can they re assign it to others, either in part or whole? Can the copyright owner revert rights, given or taken, if the copyright ownership of the original work changes? Can the originator object? History is littered with cases where the result was not what people expected to happen at the beginning and where market dominance created a new venture not previously envisaged. Publishing is a rights business yet we often seem to struggle managing them and the older the content the murkier rights become. Today is the right time to revisit the question of Google’s Book programme and not continue to go blindly forward as if nothing has changed. Having seen Charles Leadbeater at the recent BA conference and heard his logical and refreshing insights I had to buy his book ‘We Think’. Rarely do you find a business book that is a ‘page turner’ and thought provoking as this one. Does he say anything that is significantly different than others or give you a clear road map into the future, no. However his put a first class textural wrap on the changes taking place today and importantly ties this to where we have come from. This compliments the work of many and pulls it together in one book. Media and publisher should read this book and think about the new social network and collaborative opportunities and ownership and control challenges it proposes. Having read the book it has changed my thinking on many digital issues and spawned many ideas and clarified many issues which I now want to take forward. It also confirms that the book is far from dead as you would not read this by instalments nor electronically but as I have done today wish to share it will others. Life on the Internet is short lived and what was heralded in 2006 as the answer to all searches, Windows Live Book Search is being wound down. Their relentless hovering of all before them, was only matched by their often lack of real market understanding. The capture of national archives was seen by some as bad, blind and the act of an omnivore and by others as the act of an archivist and as a counter balance to that other omnivore, Google’s Book Search. Well where does this leave us? The answer is not simple, but the point that we think is relevant, is that often outsiders come into a market with money ideas and a mission. They stomp over everyone and are often single minded both in their attitude and the lack of real understanding of their actions. Microsoft, Google, Adobe, Sony, Philips, Nokia, Samsung etc all will enter quickly and may leave just as quickly. They are often treated with mixed emotions, but one always has to remember is that this isn’t their primary market and they are not driven by book sales. They are driven by advertising revenues, device sales and a whole host of other stuff. We will all wake tomorrow, get up and maybe, just maybe, some will finally smell the coffee that was smelt by others some time ago. It is always interesting to see new digital offers especially one that potentially can change the way we work and support the existing publishing channels. We have written before about the need to change the print on demand model from print and distribute to distribute and print. Changing the wasteful trucking of books and making the books truly on demand at purchase. We have also written before about the PSik 1Book™ model D which is PSik’s 2nd generation Books-on-Demand (BOD) system which prints and binds paperback perfectbound books in black & white and colour. 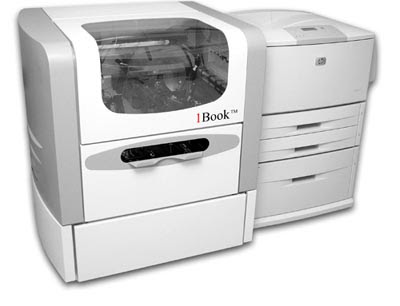 The system claims to be able to print an average 250-page book in five to seven minutes and not require a dedicated operator. PSiK is an Israeli company who have developed the technology and are now showing their latest model at the Drupa show in Germany. Why Drupa and not BEA and LBF? They may believe that the printer is still in change of the print and therefore it is better to align with them but as we have seen with Booksurge and LSI it is the channel that can make or break technology. All this comes on the day that the UK’s Shadow Minister for Culture Ed Vaizey is reported The Bookseller on his ideas beefing up the role of libraries and positioning them in the heart of the community. At a time when the book budget is the book budget in a library community POD services would appear to offer much. We fully support the standards bodies position on the use of individual ISBNs to identify the various different manifestations of a work. If there are three different ebooks, a hardback, two different paperback an audio and a large print, then each should be identifiable. We also have long supported the use of the standard work number which has taken what seems an age to come to the market but can still do a much needed job in grouping all the various manifestations of a work under one umbrella. It would be good if some major players were to now insist on it use and full adoption and force the market to use it. There is nothing more frustrating than finding the various manifestations more by accident or resolving a widget only to be made aware of one of the works manifestations. The ITSC is not a traded unit but an attribute, or descriptor, that enables you to group many individual traded units together for information. It could be adopted initially just to group the digital manifestations of a work. The other interesting areas are the selling of chunks, part works, chapters of digital editions and time rentals. These are harder to resolve but are equally important as they may have to be identified against royalty tracking, rights licensing and usage and permissions. Finally, should be the ISBN on the copyright page of an ebook reflect; the physical book, the individual ebook, the work number? Today the ebook is usually a straight copy of the physical one and therefore using that should be acceptable but as they evolve and start to differ then this may not be the case. As the copyright relates to a work maybe this is where we should use the standard work number? We do not envy the hard and often thankless work done by the standards bodies. They now not only have to grapple with an explosion of issues but more importantly have to communicate these succinctly to market and achieve their adoption. The greatest area of waste is often where you have to get your product seen. We may well used eco friendly paper, reduce the book miles or even cut back on executive travel but given the sheer number of titles, publishers and third parties waste prevails. Promotion, publicity and marketing, not only burn money but also currently generate more paper. Anyone who receives those glossy publisher and wholesaler’s catalogues, or a constant stream of advanced information sheets, review copies or turns the pages of any trade paper is witness to the waste generated in merely the industry talking to its self. It is estimated that between 6 and 15% of initial print runs are given away as review, gratis or inspection copies. HarperCollins, reportedly distribute around 100,000 catalogues not once but three times a year. Paper, post and labour waste, that is replicated throughout the industry. HarperCollins is among a group of major trade publishers who have recently announced that it is planning to convert its publishing catalogues from paper to online and have called the current system both economically and environmentally indefensible. HarperCollins President Jane Friedman in an article in the Associated Press stated, "I think we are overdue. We produce thousands and thousands of catalogues, many of which go right into the wastebaskets. "Interestingly, their first class statement on environmental policy posted on their UK web site covers much but says nothing on marketing and promotional waste – perhaps it’s a given. The question now is will the booksellers respond to the new format or take the traditional route and request a paper catalogue or ignore the ecatlogue and buy elsewhere? We can all see waste but realising the saving is often difficult in a many to many supply chain. Think how long it has taken the industry to move along the obvious supply chain logistics agenda. Digitisation offers publishing far more than ebooks, audio downloads and online and marketing is one of the big prizes. "HarperCollins UK stopped its company-wide glossy 4-colour sales catalogues in 2006. Instead they publish a condensed one-colour stocklist on recycled paper twice a year in line with bookseller demands." What’s on your bookshelf doesn’t automatically mean that’s good or even that you have read it. In some cases it’s collectable and sometimes its place is given for a sentimental reason. When we look around our home office today we find some 30 plus books written by close family, 70 plus signed and written by friends and some 50 rare books. Next door there is another set of shelves with reference, lots of travel books, novels and others works. Our other apartment has thousands of books and six large bookcases, two of which are dedicated to art, design and photography. So what do you recommend to others and why and how do these represent you? Today we have the launch of BookRabbit a new venture aimed at being a social book site, a bookshop and focused on redefining book buying on the Internet. It has had little problem in attracting media coverage and is headed up by Kieron Smith and backed by Charles Denton’s money. The idea is not new and others are doing similar most notably Shelfari.com. BookRabbit combines a social networking, browsing and a book shop offer. It plays heavily of people recommending books to others and offering their own bookshelves to entice others into reading books that they would not have heard of. It tries to create a ‘I belong’ community but are books enough and are they too broad and diverse a media? There are some interesting issues. The book-world, unlike publishers and the high street, is not front list loaded. Most people’s collections are not time sensitive and consist on not only those books that may have failed in the market, but many that are now out of print. Importantly most book collections are eclectic and defy pigeon holes. Therefore the fulfilment offer needs to be far deeper and offer sources such as ABE or Alibris. We had great fun searching and collecting together some 134 books of some friends and family, but didn’t find it easy. Many of the searches result in out of print results and understandably lack jacket pictures. The search results can be frustrating, rendering too many unwanted results and what many fail to address duplication and bad grouping. We typed in a good friend and prolific writer’s name ‘David Day’ and the results were to say the least frustrating, even on the advanced search. The site has much that is fresh and new but why if it is building a community and trying to redefine book buying are discounts so high and across such a wide range of titles. When we read this week of the apparent further demise of book clubs, such as Bertlesmann, we see new opportunities to redefine book clubs. Perhaps Shefari and Bookrabbit are some of these, but building community and selling books is not easy and we wish them well. Having now written 400 entries in this blog we felt it appropriate to return to that often under reported and confusing issue of the US Orphan Act. We first raised this issue in the Brave New World report some two years ago and the Orphan Works Act of 2008 has since made progress through both the House and Senate. 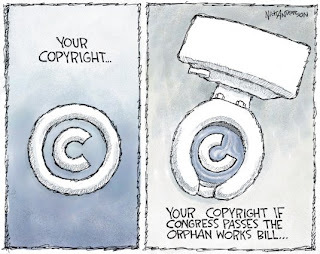 The Bill attempts to create a system where new creators can use old works without fear of massive lawsuits, provided that a good faith effort has been made to find out if the work in question is copyrighted. Let’s remind ourselves of the problem that is trying to be solved. You want to use a piece of old film footage or a photograph that contains no copyright information. You attempt to ascertain the owner but to no avail, so you use it, it is a success and then, comes the lawsuit. The picture might be an "orphan," one without a “parent” or copyright holder. After all artists die, publishers go out of business, some people never registered their work and it can often be impossible to locate the owner. To qualify for this protection under the act, the new user must perform (and document) their "good faith" search and show that they could not locate them. They must file a "Notice of Use" with the Copyright Office and provide attribution about the original copyright owner, if they can find this information. They must also include a special "orphan works" symbol. Lets step back from the legal implications and understand the massive issue that are at stake and the respective agreements from both sides. First the statement made by The US Register of Copyrights, Marybeth Peters, to Congress in March this year. Second a blog by Nick Anderson, the editorial cartoonist with the Houston Chronicle in his blog last week and whose Cartoon captures his thoughts. Technology is exploding the previous restrictions on how and what we could do with content in many forms. It is now bringing all the works ever written, drawn, painted, photographed, recorded and filmed to each and everyone of us. Many will be public domain and available to be used, others will be still available and clearly defined in terms of ownership and there will be many, some would argue the majority, that live in a grey area where ownership is unclear or not easily resolvable. Today one of the greatest challenges to digitisation on even current works is that not all rights can be digitally cleared against a work. So it is fair to assume that going back is going to get murkier. We may not agree with all of the agreements from either side but in a world where land grabbing is often the norm and creator earnings are not guaranteed we should always focus on the side of the creator. Ever wondered why they named themselves Amazon? A river that a twists and turns may be a metaphor for one of the most powerful things ever created… far from meandering, the Amazon of the book world is quietly building empires on its banks, great treasure houses which mortals will only marvel at in generations to come. At a time of the conquistadors when the New World was being discovered and tales of riches abounded, the ancient Inca Aztec and Chibcha civilisations enjoyed their wondrous riches. Tales of bare-breasted Amazonian women warriors (a myth which gave its name to the river) guarded vast civilisations along the river bank. Today are Amazon lining their chests with bounty before the explorers and eccentrics arrive to colonise them? The thick jungle of misinformation and ignorance surrounding digital content will make the age of discovery a long way off. Meantime, Amazon grows in stature and mighty presence just as the voluminous river is wide and deep and long. How many more similarities are there? Imagine a world with no loose change, or plastic, or airline / travel tickets, coupons etc. just a mobile phone. The phone becomes a wallet, access card, identification and communications gateway to the internet, direct networks, the world. Is this so far away? Technology is here today which companies such as Nokia have already introduced devices to use which enables small payments from mobile phones by just flashing the handset. However we are caught in a catch 22 where wide adoption requires prices to drop and a price drop requires wide adoption. Research firms Strategy Analytics and ABI Research have forecast the 20 percent penetration would be reached in 2012 and that this should trigger adoption. ABI Research also have forecast that 6.5 million phone that contain the contact-less chip called NFC (Near Field Communication) will be sold this year, a figure up 10 fold from 2007. Last year Nokia, large European and Asian carriers initiated a project which also involves the world's biggest payment card company, MasterCard. The communication is said to be cheaper and much faster than other wireless payment experiments, such as SMS text messages. News that RIM the makers of the email addicts BlackBerry now plans to launch a touch-screen version later this year was reported in the Wall Street Journal. The new touchy device, is named the Thunder and is to be sold exclusively through Verizon Wireless in the U.S. and Vodafone PLC elsewhere. Also this week, RIM announced its BlackBerry Bold, a sleek smartphone with a keyboard aimed at its core base of business users and on Wednesday IBM said that it has started selling software allowing Blackberry customers to access its Cognos business intelligence software allowing customers to view real-time analytics on the state of their business on their BlackBerrys. IBM has also introduced programs to allow BlackBerry users to quickly locate and communicate with colleagues with expertise in specific business areas and also to access personalized content from their corporate websites. Is the Blackberry coming out of the pockets of the business community with its touchy feely iPhone response or merely entrenching itself further into it with its alliance with business information and IBM? We think that we are seeing a device fighting to keep pace with those all around it and desperately seeking to pamper to its core base. It will be interesting to see a touch screen being used on a Blackberry but again maybe not. The world of customer loyalty and rewards is ever changing and presents opportunities not just to sell vouchers but reward sales and build community rewards across a wide range of retail offers. Imagine buying books as a result have the opportunity to win a holiday for 4 people valued at Aus $6758 and including flights, car hire and accommodation, or 4 return airfares valued at Aus $10,000 on KLM Royal Dutch Airlines to Europe and Aus$3,000 spending money, or a LG Home Entertainment System and Personal Navigation System valued at Aus $5,096. Imagine buying books and having the opportunity to win instant prizes such as 1 of 20 Aus $100 RedBalloon Days vouchers, or simply a muffin Break buy 1 get 1 free coffee vouchers or Aus $100 book packs. Australian bookseller, Angus & Robertson, has 180 stores and has launched a customer loyalty programme with members earning one point for every dollar they spend in-store. When members reach 100 points, they are automatically rewarded with a Aus$5 gift voucher. In addition the programme also enters customers into a competition where they can win a range of instant prizes and also are entered into prize draws. The system uses a thermal imaging graphicard which is rewritable and can change messages and images on the card each time the card is used. The card will display the number of points needed for the next reward, as well as promoting new releases and special offers. Today we were reading an interesting article in The Sunday Times ‘Gizmo’ section by Alex Pell. It was as if we were reading the future even before the ebook take off has happened and we realised that we are in close danger of following the same idiotic route. Last month Microsoft announced that from the end of August songs bought on its MSN Music and DRM wrapped on the unfortunately named ‘Play for Sure’ service would not be transferable to unregistered devices. So when the PC dies in September and you buy a new one your music dies with the old one – stupid. This would be bad enough if it was a single incident but Virgin Digital Music did the same when if shut up shop last September, Sony also did the same when it closed down Connect Music in March. Why do industries get seduced into giving away their control to third parties, aggregators, technology companies and potentially laying themselves open to bad customer service, and lost sales and customers as a result? Often their motives and drivers are not shared with the consumer, the publisher or the artist only their shareholders. So is the ebook experience going to be any different? Will the digital books bought today and tomorrow with DRM protection turn into the eight-track and betamax files of yesterday? Some would argue that the digital debate is missing many issues and focusing on the wrong ones. DRM has the capacity to do so much good but like in the music industry also such much harm if it is allowed to be preparatory and dominate. Interoperability is a key word that is often missing as formats are tied to specific DRM services which are in turn tied to specific devices and library management tools. Some would say that the publishing industry appears to be walking blindfold down the same path and in some cases with even the same players. Today we read the trade press and of much noise about open formats. Some would argue that defining ‘open’ is often hard and they would question whether a format by itself can ever be open without an open Digital Rights management and an open reader platform. Of course we would all love just one way of doing business, one way to hold a file, one universal file we can play anywhere and that no matter what device the file is loaded onto it will be able to read it and render it for all to see. Then we hit the reality check. Manufactures develop their own way of doing things for obvious reason. Industry bodies may adopt and or adapt these or start again with their own standards. However, the nature of all standards are that they are a framework, a common way of describing things and actions, and that there will always be options that are always exercised. There are three elements to consider when we talk about ebook downloads; the format, the DRM and the reader. Today we have a number of downloadable formats; Adobe ebook, Microsoft Reader, Mobibook the emerging ePub and others. Software developer Adobe has thrown its weight behind the IDPF and the epub format with its ADEPT service. What differentiates these from say a PDF, HTML or a word document is that they are constructed to work as a book or large document and have an associated digital rights management that can encrypt and enable the files to be securely transferred between platforms. However some may argue that these formats are more restrictive than XML and similar formats such as HTML, Plucker, PDF and others. This new epub format came from the IDPF industry body and the same stable that gave us the OEB format. The epub format differs in that although it is an ‘open’ format today it does not have an ‘open’ DRM. If the DRM was open then anyone could effectively bypass it and effectively defeat the whole objective but when DRM is through one route then surely it is no longer 'open'. epub may well be adopted by a number of major players who in turn will develop their own DRM wrap. Does that mean the format is not ‘open’ – no. It merely means that the native file is open but the route to market is not. Next we have the readers; Kindle, Sony, iRex and many more. We have seen the rise and fall of many readers over a relatively short period and will probably see more of the same in the future as the market starts to develop. Each has its associated format capabilities; Kindle and iRex the Mobibook and Sony BBEB or now epub with Adobe being rendered on a wide range of devices. The issue is that a mobi file will not be playable on a Sony device and potentially a epub file bought for a Sony device will not be playable on a Kindle, or currently on a iRex or a Palm or any other device today. When we get down to ebooks on mobiles the debate currently gets much murkier. Here the capability to free the pages and reflow them is seen as essentail and fixed page formats will not succeed. The real problem is that consumers are confronted by conflicting formats and what could be best described as a DRM land grab from publishing and technology companies. Dr Greg Newby, CEO of Project Gutenberg is reprted in an article in PC Pro last year stating, "Fundamentally, eBooks are files, and having the file locked to a particular device or software that only runs on a particular device, or some other sort of protection or encoding, is unfriendly to readers." We can’t comment on some of the conclusions drawn by some commentators but we can understand the term ‘land grab’ but believe that the PC Pro article, even though its out of date now, is worth a read and speaks frankly and openly about some of the relationships that are dictating today's landscape. Experiments are being heralded as the way forward in the digital world. Lots of small steps and not huge leaps. However, the question is not whether experiments are right or wrong, but where is the money and do they give a return or are they just throw away in search of the Holy Grail? When we think back ten years to those heady CD days, it was not only bold moves, but also unchecked experiments that brought some issues to a head and seriously burnt some publishing fingers. Today we read an interesting article in Publishing News ‘Beware iWords is coming’ from two partners at KPMG. It clearly draws much from the music experience and the premise of the article is to learn from music, advocate publisher experiments and for them to take control. However, we are not one industry but several bound together by a common format the book and the book itself, unlike music is the content, the format, the rights package and the reader. When we looked at the music industry in the Brave New World report, we sought to dispel some of the urban myths and focus on the issues that counted. Unfortunately today many still believe in those urban myths and often as in this article rewrite history to fit their case. The article talks about taking control of digital reporting of download information. This can easily be resolved not by tighter control of the reporting the obvious flawed route advocated but by adopting drop ship models that store once and distribute many. Any publisher who is aiming to store their files in more than half a dozen trusted parties could be said by some to have lost the plot. That music companies continue to cut deals and scatter their files lioke seeds in the wind is the real control issue. The migration from albums to tracks was more to do with pricing issues and peer to peer experience than iTunes. The record companies had long been pilloried for their territorial and high pricing of CDs. They may have escaped the monopolies reports but could not escape the consumers. Social networking offers much but who is the natural driver, the publisher, the author , a retailer or an outsider who has the other elements of the jigsaw? Some of this is down to brands, some down to marketing and innovation and a lot is down to connecting with consumers. Multi media is a real opportunity and one that can enhance the text content and in some genre is increasing in importance. The issue here is whether the media is added as an afterthought or built in from the start and present throughout the publishing life-cycle. Today many of the development process employed are still analogue and now need to become digital. So was the article right or wrong, informative or mere noise? All we can say is that it did stir our thinking and promoted this response. We read today in the Bookseller that Hachette Livre is to acquire French digital book distributor Numilog. The move is reported as being designed to 'prepare Hachette Livre for the launch in France of the Sony digital e-book at the end of this year'. Some may think differently, with HaperCollins buying into and have a board presence in Newsstand (Libre Digital) and Macmillan owning MPS it would make sense that Hachette now are wanting to be in control of their own destiny and not beholden on competitors alliances. Some may think this far more strategic than the previous announcement last year. Obviously they can also use the facilities to service other third parties and in doing so cross substdise the venture and ensure it has a wider uptake. Its interesting to note that Numilog holds titles in all formats which again buffers Hachette against any ill winds that may befall the long heralded and yet to appear Sony ebookreader version 3. Conferences fulfil two needs one networking and meeting peers and secondly to gleam information of what is happening in the market. The need to understand the market and seek examples of best practice and benchmarks is very important when the market or subject is in a changing and volatile state and it is understandable that we see a mass of digital conferences at this time of change. That silly time has come around again when a certain major conference event’s organisers are requesting presentation submissions for the end of the year. Last year we offered an outline and said it was difficult to give more details 6 months ahead of the date. We were obviously rejected and looked with some amazement as the usual speakers and sponsors secured slots. Conference organisers should actually do their homework and research the best speakers and topics themselves and not merely scatter seeds around in hope or asks sponsors to subliminally advertise. There are many great stories to be told that sadly remain untold. The ironic statement is that the conference calling notes even state that these are highly volatile and rapidly changing times and that ‘2008 is proving to be a year of unprecedented uncertainty’ so the logic is that much may have changed in six months! Other than a high level synopsis of our presentations, we rarely write any detail more than one month before speaking and often it is one week before. Some may say that is too short a period but we like to keep it fresh. The other conferences we have strong opinions on are those where you are asked to sponsor, are then graded according to the wedge you deposit and are given speaking slots on top. This would not be bad if the delegates were admitted free, or at minimal cost but they then charge the delegates top ticket too. BN.com have announced they will be selling magazine subscriptions to over 1,000 magazine titles in both digital and print formats. Prices will offer up 90% discount off newsstand cover prices and digital subscriptions will be almost instantly available on desktops and laptops. A further 12,000 back issues of hundreds of magazine titles will be available digitally for purchase. This is a natural extension of BN.com’s partnership with Zinio who have long offered online subscriptions and browsing to the magazine market and power B&N’s “See Inside” widget feature, which provides previews of book content. The “See Inside” feature will now be extended to preview certain magazines. The offer also includes a partnership with M2 Media Group, and provides the first fully integrated offer of magazines and books. Previews of content are becoming increasingly important and we have already seen a number of variants in the market. It is clear that they need to be able to render all types of content and not be fixed to a book format and text. Features that promote illustrated and picture books are just as important as text and being able to embed other media and metadata within the feature is a logical extension of where many are today. The questions are to do with who produces the material, who controls it and as to whether there will be many variants of the same book within different sites? The survey of 435 editors-in-chief, deputy editors and other senior news executives from around the world provides an interesting insight to a content industry in change. The "Newsroom Barometer," conducted by Zogby International for the Paris-based World Editors Forum and Reuters, found that 85 % of editors are very optimistic or somewhat optimistic about the future of newsprint in the digital age. 40 % of editors believe on-line will be the most common way to read the news ten years from now with 35 % believing print, 10% mobile , 7% cite e-paper. And two out of 10 respondents say it will be technologies that are still in the emerging stage. 50% the respondents believe that journalistic quality will improve over the next 10 years, versus 25% who think it will worsen. 80% view online and new media as a welcome addition. Those with high volume web traffic -- more than 200,000 unique visitors per day -- are more likely to view new media positively, but the majority of editors at newspapers with modest traffic or no web sites also viewed new media positively. 30% respondents view free newspapers as a threat to the market, while 34% welcome them, 28% consider them negligible. Training journalists in new media is cited most often by editors as a priority to increase editorial quality. Hiring more journalists is the second most frequently cited priority. According to the survey, 56% believed that the majority of all news would be free in the future, up from 48% who answered yes a year ago. In the emerging markets such as South America, Eastern Europe, Russia, the Middle East and Asia 61% believed news would be free. In Western Europe this reduced to 48%. iRex Technologies, the Dutch spin-off from Royal Philips Electronics and ebook pioneer is introducing a , iLiad Book Edition, an ebook reader aimed at the book market. They have reduced the price and simplified it from the previous iLiad. The new iLiad Book Edition will be available for sale beginning 9 May at a cost of €499 and as many comes pre-loaded with 50 English classic works and 8 gigabytes of extendable memory. The screen allows ease of reading with close to a 180°viewing angle. Userscan make notes on the pages and can transfer these to a PC and also share them with friends and colleagues. Over 50,000 titles, are available to buy via Mobipocket, the e-book format from amazon.com. Will the iRex be better than the Sony? When will Sony announce their upgrade to accomadate epub? 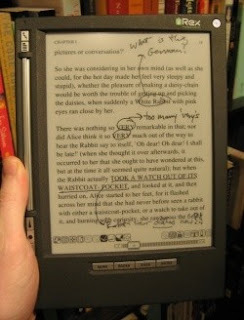 Will users choose epub with Sony or Mobi with iRex and the Kindle? We live in interesting times. Television is rapidly changing and the uptake of services such as the BBC iPlayer are redefining our viewing habits. The move away from real time viewing to offline viewing has been happening for some time and the iPlayer has just taken the model one step further. What is significant is the quality of the presentation and although the sound can be limiting sometimes the pictures are not. Microsoft have now announced that it will follow Apple’s initiative and be offering television shows on its Zune portable media device from NBC Universal. NCB shows such as ‘The Office’ and ‘Heroes’ will available for playback and the service will also include Comedy Central's "South Park" and MTV's "The Hills" available at a pre paid cost of $1.99. But the Zune will not be alone in this space with NBC also appearing on Amazon.com’s Unbox service and News Corp.'s Fox Hulu service. The question remains whether the iPod and Zune devices can beat the mobile phone players in the portable market and other online services in the home online market? This week we spoke at the Danish National Museum at the EBOG publisher’s conference. It was interesting to see the delegates divide into two streams not to discuss digital distribution but digital marketing and the impact of digitisation on the editorial and production processes. Digitisation as we have said many times is not about ebooks, audio downloads, widgets, blogs or social network sites, they are the delivery forms. It is about how we acquire rights, develop them, publish them, market and promote them and fulfil them. It was therefore interesting to hear how Danish publishers are starting to grapple with the wider issues right across the publishing life cycle. Standards have always been open to variation. Going right back to our days with ecommerce EDI, tradacoms and later the EDIFACT standards often differed between trading partners. The basic schema and semantics were the same but the actual interpretation and use of individual fields could vary. We all adapted and built or used front end conversion services that could normalise the data. When we moved into the digital content world, we all understood format wars were a necessary evil and often wished them away. They often fed consumer apathy and indecisiveness. After all we have all bought technology that soon became obsolete. We remember the old 8 track, the Sony Walkman, we lived through betamax versus VHS wars and much more. Often one standard or format dominated but the logic as to which was going to win was not always done to the best technology or the best format but down to factors often outside of these. We now have print on demand services which are now becoming pivotal to certain publishing programmes such as vanity publishing, short cycle print runs and academic. So is one print on demand file the same as another? Can you take a file created for one service and automatically use it on another? Unfortunately not, but the differences although often minimal are still a change. Files created for one service are not truly generic. Today we have digital books that can be formatted in several different ways; Microsoft Reader, Mobibook, Adobe ebook, etc. We have added digital rights management encryption that can be applied to protect the content and have a myriad of devices that can render the files. So what happens with open formats such as OEB and epub? Well the reality is that they are often both open and proprietary. There are exceptions and the most well know of these is MP3. Not the best format technically but one that is able to be played on almost any device and through a vast number of software players. The fact that makes this possible is lack of DRM on MP3. OEB (Open Ebook) has long been used by many as an open digital standard. Are all OEB files the same? No, and many aggregators have their own interpretation. Its derivative epub is now being heralded by many as the new dawn and a truly open standard, but today there is only one DRM service that can encrypt it and only one player that can render the encrypted download. Will others follow – almost certainly? Will they be the same in their encryption and rendering requirements - almost certainly not. iTunes built an empire on the service, the player and a proprietary format. Audible has built an empire on a proprietary format and DRM operability on many players. Both are now seen to have helped open up the market but also restricted it. Today we have Mobi and Amazon and epub and Sony. Sony appear to have dropped their previous proprietary format and see epub as a more acceptable industry way forward. Adobe’s PDF based ebook reader is still a major force and will be dominant in the market but as we shift towards the mobile device market then the ability to reflow text and chunk files would indicate that the tagging formats of Mobi and epub will come to the front. However, DRM remains the key to the downloadable file world and the mobile platform the real battleground. The music business is being constantly redefined by access and free to play. It seems an age since we first wrote about the SprialFrog service in the Brave New World report and the service is now live in the US. Others have followed the model and the most significant of these is Nokia with its ‘comes with music’ service. They have clearly separated the content from the format from the device. Their focus is to sell mobiles and maintain their share of this huge market. To do so they must offer services that others can’t but unlike the iPhone’s lock in to service carriers Nokia is agnostic and will play with them all. Nokia, is the first mobile manufacturer to push heavily into content but others will follow. Last week they struck a deal with Sony BMG to offer their catalogue to that of Universal which they secured last December. Importantly Nokia, have decided to differentiate themselves by allowing users to keep all the music they have downloaded during their contract. Nokia sold 146 million music phones last year and if all of those had included the "Comes with Music" bundle, just an extra $20 per phone would make Nokia's service bigger than the total digital music market. The sales of their 5310 and the 5610 top music models alone, were more than 4 million during the first quarter of 2008. Ironically, the record labels hope that Nokia and others start to challenge the dominance of Apple's iTunes but the question remains whether they are merely bouncing from one offer to another devoid of strategy or have a master plan to restore their ailing businesses. Now we must start to rethink who is the natural service, platform and what business model will work for the digital content we call books.